Toshiba Excite AT200 is the World’s Thinnest Android tablet which was showcased first time at IFA 2011. 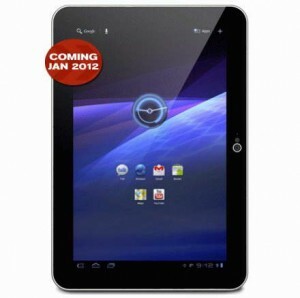 Now this tablet is listed in the Toshiba Canada official site with a January coming Soon tag that’s mean it is going to launch in Canadian market in early 2012. The specs of Toshiba Excite are really impressive as compared to Toshiba Thrive. This tablet is running on Android 3.2 Honeycomb operating system. It is around 7.7 mm thick so simply it is thinner than Samsung Galaxy SII. On board, there is a 10.1 inch display that boosts up the resolution of 1280×800 pixels. Other specs of Toshiba Excite AT200 include 1.2GHz dual-core OMAP 4430 processor, 5MP rear/2MP front facing cameras, micro HDMI . It will be available in either 16 or 32GB versions. Now we have to see what price tag is attached to this Toshiba Excite Honeycomb tablet. It would be really surprising for us if Toshiba launch the tablet with Ice Cream Sandwich.